Education is considered as an effective way to avoid discrimination and poverty that disabled children often face. But the physical impairment with different conditions creates the barrier for the overall development of the person. It is has been observed that around 80% of the children in the world are living with disability, but their efforts and hard work enables them to stand on the bigger platform and achieve higher level of success through education and their skills. For providing equal status, opportunities and platform to the special students, 3rd December is celebrated as World’s Disability Day. A special programme has been initiated by the NGO “Umang” that also gave platform to different students to speak in front of the world. This opportunity has been giving to the alumnus student of Arya College, Avinash from MBA branch. He has spoken for Nobel cause and deed. He motivated the public about the concern and responsibilities of every individual towards the society. He considered himself lucky to get the education from Arya College, the man who is a great example of success. He showed many examples that proved themselves as the topper in the first year of their graduation, even after several disabilities. 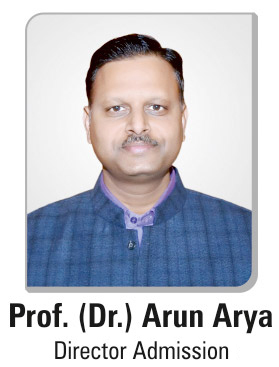 Large numbers of students with physical or mental disabilities are provided with great opportunities at Arya College, so that they can fulfill their dreams in their college life. They believe that little efforts in infrastructure facilities and helping hand of the college and colleagues can changed their lives. Most of the people believe that everybody should have this kind of privilege and liberty to showcase themselves at a greater platform as these special people deserves the best. St. Xavier’s Mumbai, IIM Bangalore, St. Stephens College and Delhi University have taken initiatives for the sensitive problems faced by these students. Also, they requested to transform this issue in all the colleges of Jaipur. One of the students narrated his story at the event that he has requested the founder of the college to shift his college from third floor to the ground one. Also, he found difficulty in copying the notes from the blackboard and he was unable to move his steps to the bus stop as the driver refused to enter the bus in the college campus. One student says that she finds difficulty in reaching to the classroom from the bus, whenever they did not find any support. But now, College committee have made special planning for us and hired security guards that always lay a helping hand whenever it is required. Also, different kinds of facilities have been provided to us so that we can learn and achieve maximum to their capabilities, skills and knowledge. The programme concluded that special audio notes will be provided to them so that they can learn very rapidly. Students are struggling at the time of main examinations due to the restrictions and protocols of the college. But the college committees are not taking care of the hurdles and obstacles they are going through to achieve higher degree and qualification important for their career and future life. So, it has become responsibility to aware the students about their rights without any discrimination.